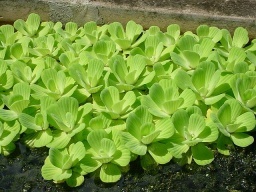 Water lettuce is an invasive plant that is commonly found in the southeast region of the United States. It has been known to clog waterways, making fishing, boating, and swimming difficult in affected areas. The plants grow in expansive mats that block sunlight to submerged aquatic plants, leading to lowered levels of bio-diversity. Water lettuce can be controlled with the use of the herbicide Glyphosate 5.4. Simply spray the plants and they will begin to wither and die within a few weeks.